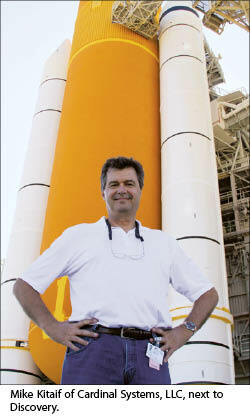 Software development was Mike Kitaif’s ticket to being part of NASA’s space shuttle program, fulfilling a childhood passion for space exploration. K itaif and software expert/co-author Tom Blankenship had been designing and developing mapping software the past 20 years. NASA first approached Cardinal Systems in 2004, interested in Kitaif and Blankenship’s mapping software that included a 3D stereo component, ideal for taking detailed photos of the craft’s exterior. The Columbia disaster the previous year, in which a piece of foam insulation broke off the external fuel tank during launch causing the shuttle to then break up during re-entry, had NASA looking for a backup inspection system to prevent another tragedy. As Kitaif explains it, the shuttle is arranged in what is called “the stack.” There’s the orbiter where the astronauts are seated, the huge orange tank that carries liquid oxygen and liquid hydrogen, and then the two solid rocket boosters. Those rockets come off after 128 seconds while the orange tank stays attached to the shuttle until it goes into low orbit and then it’s jettisoned. As the tank falls away, it’s traveling at the same speed as the shuttle, or 17,500 mph. On Cardinal’s first job for NASA, Shuttle Training Flight (STS) 114, “they lost a 39-inch piece of foam on that orange tank, a huge piece of foam. Had it hit the leading edge again, it may have been a problem. It didn’t hit anything, but it certainly concerned NASA,” Kitaif said. 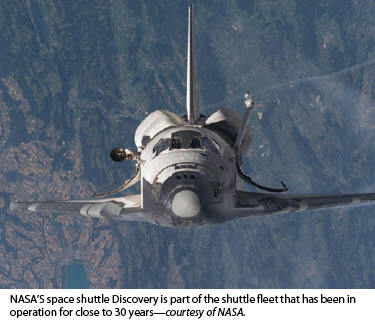 “This was the first mission where they put a digital camera (a Kodak Nikon DCS 760) in the bottom of the shuttle. As that tank fell away, about 20 usable pictures were taken that they were able to send back to the Johnson Space Center in Houston the day they launched. I got two of those photos and was able to see 3D on that tank and make measurements. We were able to measure the length, width, depth, and the amount of material that was missing,” he said. 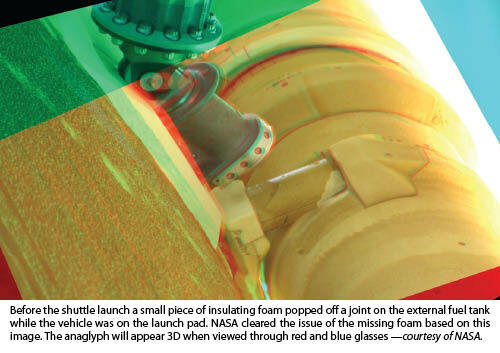 As a result, NASA changed some of its procedures, including the way the foam was laid in. “They’ve made improvements to the tanks, they’ve made improvements to the thermal protection system—it’s better than it’s ever been,” Kitaif said, considering that the shuttle program is close to 30 years old and is winding down. A flight took place in April, and at press time the final mission for Atlantis was planned for this summer provided there is funding. Just as NASA adapted with making changes to what it had been doing, Kitaif said his end of the project also went through some growth. “Because the photography is not restrained as it is in aerial mapping, they don’t have the control over the photography, and we’ve had to be more innovative, we’ve had to develop the software better …. And that’s been very good for us, not just for the publicity of working for NASA, but from a technical standpoint” of improving what they do. The principles and methods of photogrammetry are widely understood in surveying and mapping applications. Although this article relates a unique and drastically different application, those principles still apply. Basic 2D measurements can be made from many types of photos, but, as Kitaif mentions, overlapping photos are needed to create the 3D effect that allows measurement of relief. Luckily in the case of the foam falling from the shuttle’s tank, enough photos were taken to provide the necessary overlap. In typical survey/mapping situations, it is the surveyor who provides horizontal and vertical control for the photography, in the form of panel or picture points. In this situation, that control did not exist; as Kitaif notes, the photos were “unrestrained,” which required an innovative approach. But this was not the only tricky part. The control used in the initial analysis was a known dimension between two features on the tank and several “elevation” points on a known, consistent portion of the surface. Interestingly, from those controlling features, Kitaif proceeded to grid the surface, identify hard breaklines, create a DTM, and contour the surface: the same process used in any typical mapping job! This time the area of interest was much smaller (216 square inches), and the stakes were much higher. 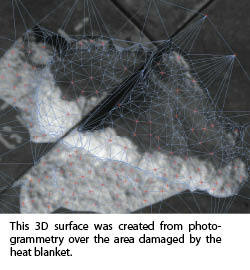 Using traditional photogrammetric techniques, Kitaif was able to set up Noguchi’s imagery in stereo and derive a 3D model of the heat blanket. Kitaif said that out of the last seven missions when there were questions or concerns, five had the matters cleared based on photogrammetry. 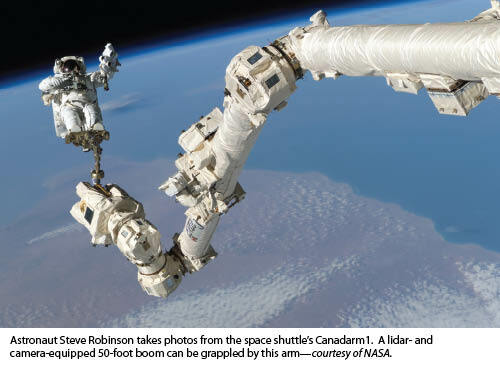 “So they didn’t have to bring out the robotic arm; they relied on photographs. They looked at the areas and said they were fine,” he said. “The arm is not something that they can just bring out and move around, and they certainly don’t want to run that thing into the shuttle and cause more damage.” Plus, “anytime they put on a suit and go outside” there’s the potential for problems. In addition to safety, there’s also a time factor, he said, with the mission losing a day each time the robotic arm has to be deployed. Kitaif can get unabashedly emotional about the space program, recalling a time he choked up when an astronaut doing a walk and from the vastness of space recited the procedure Kitaif helped write for taking photogrammetry photos. Nancy Luse is the assistant editor at Professional Surveyor Magazine.